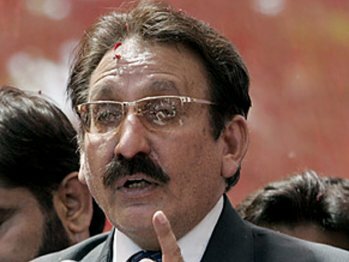 ISLAMABAD – A delegation comprising students of Harvard Kennedy School who are on visit to Pakistan called on the Chief Justice of Pakistan (CJP) Iftikhar Muhammad Chaudhry at the Supreme Court on Thursday. The CJP briefed them about the Supreme Court, the Constitution, Judicial System and the lawyers’ movement in Pakistan. Talking about the movement, he said in the history of Pakistan the Constitution has been abrogated and Martial Laws have been imposed. However, since the historic day of March 9, 2007 the lawyers’ community, civil society, and public at large initiated the struggle for the rule of law which resulted in the restoration of political system and supremacy of constitution. The CJP stated that he faced the crude vendetta of the dictator but he stood his ground to achieve the lofty ideals of Rule of law and supremacy of the Constitution. Lawyers from all over the world supported the call of independence of judiciary in Pakistan and finally a 13 member Bench of the Supreme Court restored the Chief Justice. Another attempt was made to control the judiciary. This time black coat march was also observed in the street of New York and many other cities in the world. On account of ever mounting pressure, the elections were held and present government came into power. The CJP told them that he was the first Pakistani to be presented with Harvard Law School Medal of Freedom. This rare medal is given to only those individuals who struggle for freedom, justice and equality. Earlier, only two other persons have been awarded this honor. The first was Charles Hamilton Houston, an African American lawyer who helped play a role in dismantling the Jim Crow laws and helped train future Supreme Court Justice Thurgood Marshall. Former South African President. Nelson Mandela was the second recipient of this award. The delegation presented a shield to the CJP as a gesture of goodwill. The CJP extended his gratitude, conveyed thanks and presented shields, copies of Annual Reports of Supreme Court and copies of Constitution of Pakistan to them.